Presented by KP4MD at the River City Amateur Radio Communication Society meeting, Febuary 6, 2008. The HAARP-LWA Moonbounce Experiment provided a first opportunity for many radio enthusiasts to participate in radio wave reflection from our moon, also known as Earth-Moon-Earth, or EME communication. In the past, this required a sizeable investment in specialized very high and ultra high frequency radio equipment with large steerable antenna arrays. This experiment allowed anyone with a common shortwave receiver and simple antenna to participate in this milestone in the history of radio communication. At the end of this article, I describe how you can easily recreate our experience of receiving and analyzing signals reflected from the moon with your personal computer. The High Frequency Active Auroral Research Program (HAARP) is an investigation project to "understand, simulate and control ionospheric processes that might alter the performance of communication and surveillance systems." Started in 1993, the project is proposed to last for a period of twenty years.The project is jointly funded by the United States Air Force, the Navy, and the University of Alaska. Defense Advanced Research Projects Agency (DARPA). The project site is north of Gakona, Alaska (lat. 62°23'30 N, long 145°09'03 W). 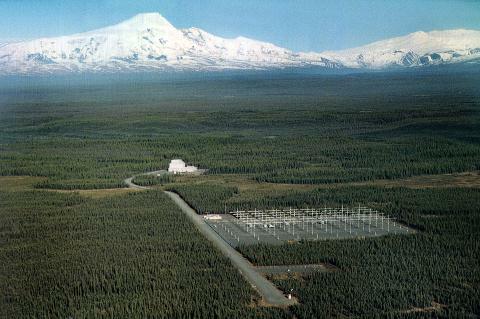 The HAARP has been constructed at the previous site of an over-the-horizon radar installation. 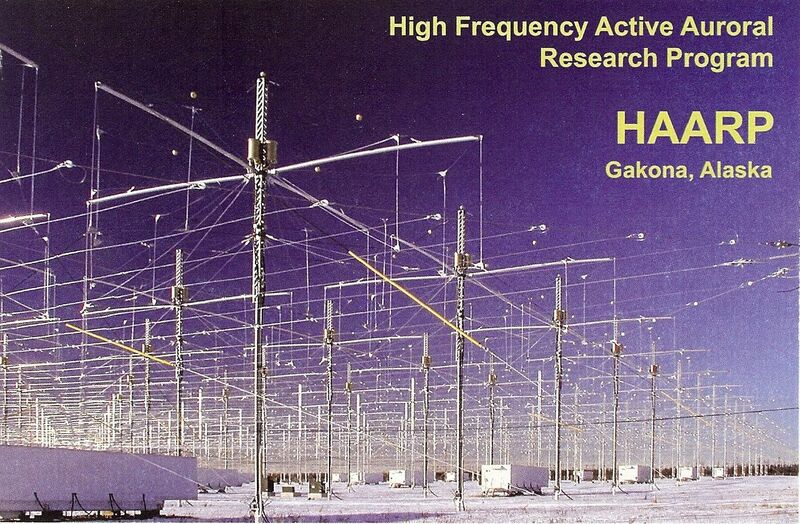 HAARP has 180 antenna units, organized in 15 columns by 12 rows, yielding a theoretical maximum gain of 31 dB. HAARP can transmit between 2.8 and 10 MHz. A total of 3600 kW (3.6 MW) of transmitter power feeds the antenna array. The total effective radiated power (ERP) is 3,981 MW or 3.981 TW. EME communications had previously been achieved on VHF, UHF and microwave frequencies where the ionosphere is transparent and the required high gain antennas to overcome path loss are more easily achieved. The goal of this experiment was to attempt EME radio communication in the high frequency (HF) spectrum (short-wave radio frequencies below 30 MHz). The HAARP array would direct its total output power in a focused beam tracking the moon. This experiment was conducted during the sunspot cycle minimum when the ionosphere is least reflective to HF radio signals and during the winter when atmospheric noise is also at a minimum. The University of New Mexico Long Wavelength Array (LWA) also participated in the experiment. LWA Radio Telescope Array: 16 dipoles with digital receivers. LWA Design Frequency range: 10-88 MHz. The project designers suspected that the test signals might be detectable with a simple short wave receiver and antenna, so they invited short wave listeners and amateur radio operators around the world to participate in the experiment and to submit reception reports. The antenna I used was a 100 foot random wire antenna raised 20 feet above the ground and a Kenwood TS-140s receiver. The receiver was placed in the CW narrow mode (500 Hz bandwidth) and tuned for a 800 Hz tone centered in the filter passband. The audio signals from the radio's headphone jack were fed through a patch cable directly to the microphone input of a Hewlett Packard laptop computer, and the signals were recorded as a WAV file and analyzed with a program called Spectran. (Spectran is a signal analysis program for Windows written by Dr. Alberto Di Bene and freely available for download at http://www.weaksignals.com/). 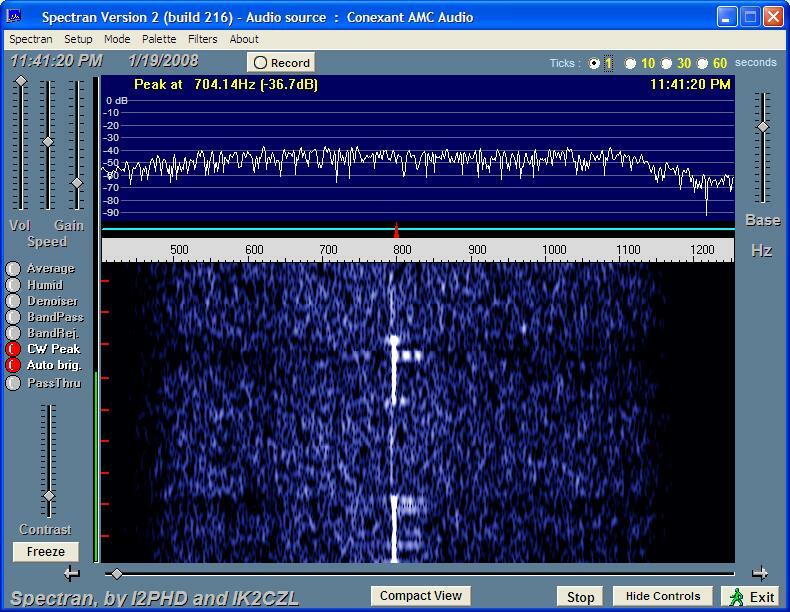 January 19, 2008 - 6.7925 MHz from 0500-0600 UTC, and 7.4075 MHz from 0600-0700 UTC. January 20, 2008 - 6.7925 MHz from 0630-0730 UTC, and 7.4075 MHz from 0730-0830 UTC. Transmission format: Since the average distance to the moon is 218,410 miles and the speed of light is 186,282 mi/sec, the time for round trip EME signal is 218410 x 2 / 186282 = 2.34 sec. Therefore, the chosen format for the transmissions was a five second cycle beginning on the hour and repeating continuously. HAARP transmitted for the first two seconds. The next three seconds were quiet to listen for the lunar echo. All transmissions from HAARP were on-off CW (continuous wave) keying (no modulation). 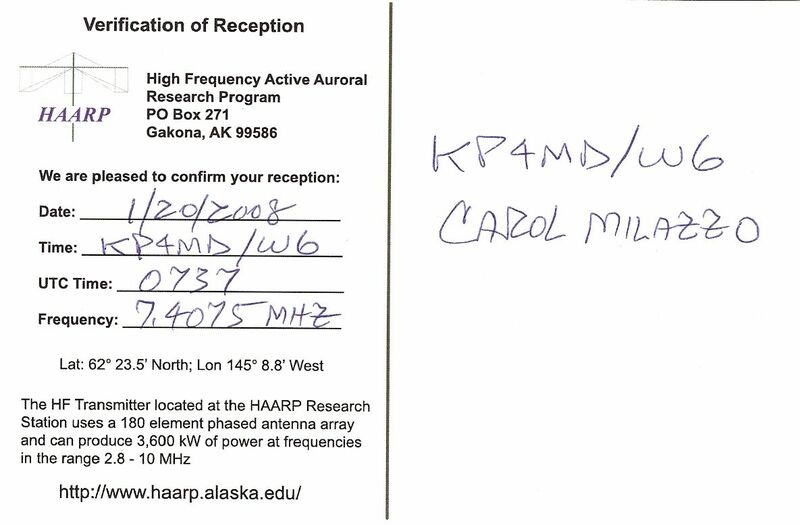 Reception report at KP4MD: HAARP - LWA Moon Bounce Signals on 20 JAN 2008 at 0737Z on 7407.5 kHz HAARP signal varied from 8-9 S units (20-30 dB over noise level) Echos were detected after about 1 out of every 10 transmissions (maximum 5 dB over noise level). In the bottom window of this Spectran display, the heavy white vertical line segments represent the 2 second HAARP transmissions received via ionospheric scatter (click on the image to enlarge for detail). The fainter thin white line segments connecting the brighter ones represent the signals reflected from the lunar surface. How to recreate the experience of receiving and analyzing the HAARP-LWA signals on your personal computer. Click here to download and save HAARP-LWA sound file.wav to your hard drive. This is a 2 minute long recording of the HAARP signals we received on January 20, 2008. Go to this page http://www.weaksignals.com/ and download and install Spectran as instructed. Click on the green Play button to hear and analyze the signals.